Recipe by: Kim's Cooking Now! 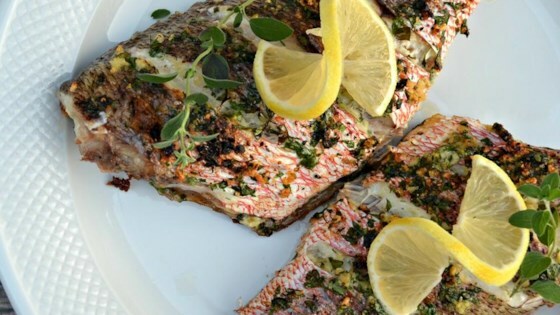 "A simple mixture of parsley, oregano, garlic, and lemon zest brings the flavors of the Mediterranean to fresh whole red snapper. Easy enough for a weeknight meal, yet elegant enough for company! This recipe was made in a Panasonic CIO." Mix parsley, olive oil, oregano, lemon zest, and garlic together in a small bowl. Rinse red snappers and pat dry with paper towels. Cut 3 diagonal slits across the top of each fish, cutting almost to the bone. Season the cavities with salt and pepper. Rub the parsley mixture on the inside and top of the fish, pushing the mixture into the slits. Place the fish in the center of the grill pan; season with salt and pepper. Place the grill pan in the Panasonic Countertop Induction Oven and press "Auto Cook." Select the Fish setting, 3, and 1-pound serving. Cook until an instead-read thermometer inserted into the center reads at least 130 degrees F (54 degrees C), about 20 minutes. Adjust time as needed. Serve with lemon slices. Here’s a fish recipe even non fish eaters will love. I don't have the PANASONIC OVEN thingy but the rub on snapper baked works just fine. I'm a skeptic and it sure sounds like those reviews were commercials for Panasonic. Give me a break!